You are here: Home > Do bumblebee’s sleep? This weekend we found one snoring away in our ornamental crab tree. Apparently the male bumblebees love to gorge themselves all day long and night, chase after the queen bees and then find a great buttercup like flower to catch some zzz’s. Sounds like a busy life. When we found this one, my first thought was that it was dead, and to see if it was in fact, touch it. Not a very good idea, I know, so would rethink that action. D and I decided to complete our walk with Barkley and when we came back the bumblebee was gone! The bumblebee unlike the honey bee, has only enough energy to carry on its activities for that day. It needs it’s “morning breakfast and jolt of coffee” or in this case nectar to restore energies to its body and fly from its flowery bed. 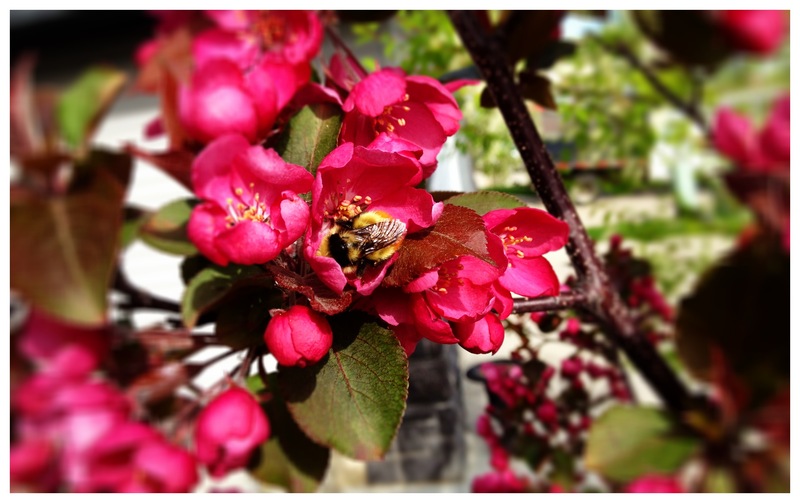 They say bees are some of the hardest, diligent workers on the planet. Bees work hard, play hard and rest completely! The reward (maybe not for our teeth)? Honey. Spring has sprung in Calgary! Although I don’t think it was a honey bee, here is Zee Avi singing about one anyway.